Much as I hate to post a “rerun,” it’s a busy week for me and I’m going to anyway. 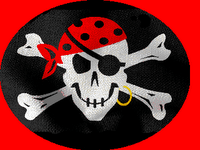 Today is the 12th annual International Talk Like a Pirate Day. Last year I wrote all about how this holiday came to be and suggested ways in which you, too, can talk like a pirate. Rather than write the same thing all over again, why don’t you just click here and read all about it. And if you want even more pirate goodness, well, you’ll want to stay away from my review of Pirates of the Caribbean: Dead Man’s Chest. It might give you scurvy!